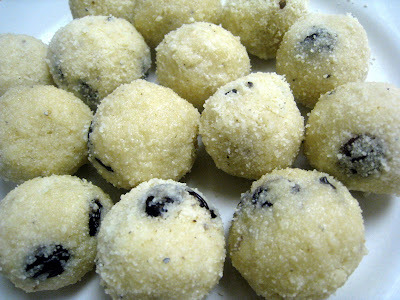 All About Konkan: Rava Laddu..
Rava laddoos are all time favorites. Adding cloves is something new. I will try it when I make them. We make two versions, one with coconut and the other without coconut. The second ones w/o coconut - break easily though. I loved your picture very much. I exactly follow the same procedure to make rava laddus. Yours turned out perfect and delicious. Adding spices is something new to me. But i can sense the aroma of them in the ladoos. Something different from routine. Looks perfect and yummy.